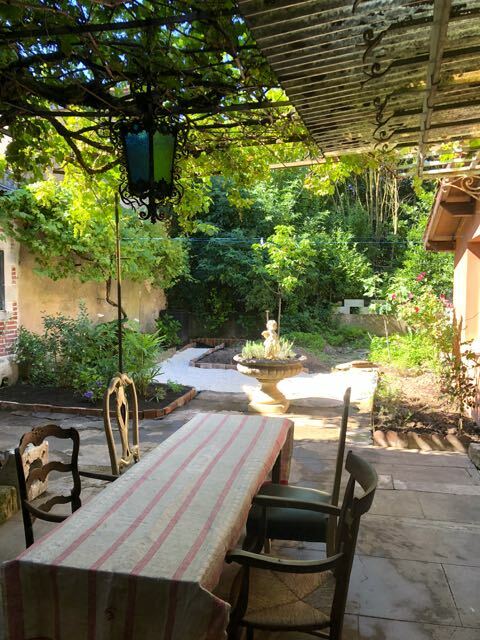 After a long and wet winter we arrived back to our French house to a jungle of a garden. The work we had done last year was surrounded by a tangle of weeds and vines. Nic and i spent many an evening pulling out the millions of Oxalis bulbs that had taken root in the garden and left unchecked took hold! We toiled for 2 months to eradicate the wee beasties but I am sure they will be back in abundance next year. We made crazy paving from all the broken concrete that was lifted up to make the garden beds. White stone was sprinkled around, (after putting down endless weed mat of course) to give the area a provincial feel. It didn’t help that the temperature sometimes reached the high 30’S. We missed out on purchasing French Lavender this year. Every plant, every stick had been bought up in every nursery. We will have to be more vigilant next year. The Wisteria we bought last summer has been so prolific it threatened to take over the neighbours roof, slipping under the eaves and through his back door!. We chose a lime wash Terracotta red for the outside kitchen walls. It compliments the green foliage and hopefully the lavendar for next year. Theres an abundance of bird life, lizards and bees and a small hummingbird type insect that hovers around the sweet nectar of the flowers. I looked it up on the internet and it is a type of moth that has a strong resemblance to the hummingbird with its long beak and fluttering little wings. quite beautiful. We sit in our beautiful garden under the grapevine each night to enjoy a glass of wine, ( or two ) and a late dinner. The sun doesn’t set until around 10. The swallows dip and dive, calling to each other. We can hear the call of children in the street, the smell of a barbecue, the greeting of a neighbours dog and soft Tango music playing in the background. I take another sip of wine and feel contented with the world.